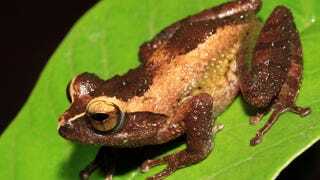 Naturalists working in the mountainous forests of Sri Lanka's Peak Wilderness Sanctuary have uncovered no less than eight new species of frogs, nearly all of them critically endangered. Sri Lanka is known for its amphibian diversity — with well over 100 species documented — but to find eight new species over the course of just two surveys is quite extraordinary. The findings were recently published (pdf) in the Journal of Threatened Taxa, which, by virtue of its title, unfortunately describes the reality of the situation. "The survey in this area was initiated due to the lack of research work carried out in this area, and looking at its geography, and altitudinal changes which varies from about 600 meters-2200 meter, and the vegetation varying from lowland rain forests to cloud forests, we knew that the area's biodiversity was under represented," he explains, adding that "tough terrain" and "harsh weather conditions" have kept scientists out until now. Each of the new species are in the Pseudophilautus genus — frogs that are only found in Sri Lanka and nearby India. Each frog was distinguishable by their unique features. Normally, a genetic analysis is required to identify similar looking animals. [M]ost of the species...should be listed as Critically Endangered, according to the scientists. Habitat loss, small hydropower plants, and pollution from visiting pilgrims are some of the major threats to these long-hidden frogs. "But apart from [this] the government is planning to construct a helipad in the area of concern right now!" Wickramasinghe lamented. Amphibians are one of the most endangered family groups in the world. Experts say that are one third of the world's amphibians are currently threatened due mostly to habitat loss, pollution, and a killer-disease known as chytrid fungus which has likely been spread by humans and exotic frogs. Scientists think that around 130 amphibians have gone extinct since 1980, about 20 of which were found in Sri Lanka. All images: L.J. Mendis Wickramasinghe.